President Hu Jintao of China is set to meet Cuban leader Raul Castro later in the day as part of his multi-stop tour of the US and Latin America. The two nations are agreeing multiple deals on trade and loans as China bid to strengthen its links with Latin American and Caribbean nations. Mr Hu was met at the airport by senior Cuban officials and cheering members of the local Chinese community. Cuban TV broke into Monday's nightly news to go live to Mr Hu's arrival. China is now Cuba's biggest trading partner after Venezuela, with bilateral trade at $2.3bn (£1.5bn) in 2007. And across Latin America, China has seen its trade climb from $13bn in 2000 to more than $100bn in 2007. "My visit is aimed at increasing friendship and co-operation between our two nations, and working together with our Cuban comrades to build a promising future," Mr Hu said in a statement. Throughout the Cold War Cuba was traditionally a much firmer ally of the Soviet Union than China, but that changed when the Soviet Union collapsed in 1991, leaving Cuba almost bankrupt, says the BBC's Michael Voss in Havana. China offered Cuba soft loans to help it through the difficult 1990s, and these loans are now beginning to come due. Restructuring their repayment is likely to be one topic on the agenda when the two leaders meet on Tuesday, our correspondent says. Other agreements already signed or set to be signed reportedly include Chinese purchases of nickel and sugar from Cuba, Chinese-backed energy prospecting in Cuba, and other deals in education and health. Mr Hu arrived in Cuba from Costa Rica, where he signed co-operation and investment agreements and discussed setting up a free-trade agreement between the two countries. He will travel on from Cuba to Peru where he will attend the Apec (Asia-Pacific Economic Co-operation) summit in Lima on 21 and 22 November. But China is not the only power interested in securing greater access to the raw materials and other resources that Latin America offers. President Hu will be followed next week by Russian President Dmitry Medvedev, whose tour of the region includes a visit to Cuba. Although both Cuba and China are run by Communist parties, they have pursued very different economic models. China has adopted market economics while Cuba still has a command system with most of the economy under state control. On Monday, Cuban state newspaper Granma praised the Chinese model but highlighted "an unequal distribution of wealth in the country, marked difference between city and countryside and the erosion of the environment". 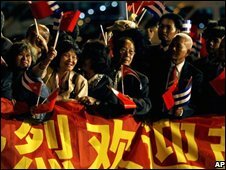 When Mr Hu last visited Cuba in 2004 Fidel Castro was still in charge of the country. His younger brother, Raul Castro, officially took over the presidency in February 2008 and has introduced some reforms. Raul Castro saw China as a potential model for Cuba to follow, says BBC regional analyst Emilio San Pedro. China, a modern-day economic powerhouse in a world of financial uncertainty, sees Cuba with its need for investment and political support as an important ally in its long-range plans to strengthen and expand its ties with the rest of Latin America, he adds. HAVANA (AFP) — Cuban President Raul Castro will attend a summit in Brazil in December, Brazilian President Luiz Inacio Lula da Silva said here Friday, marking the Cuban leader's first international trip since taking over from brother Fidel Castro two years ago. "We are pleased to learn that finally his excellency will travel to Brazil to participate in the first meeting of Latin American and Caribbean nations, without interference from any other power," Lula said during an inauguration ceremony for a Brazilian business venture in Havana. If the visit is confirmed by Havana, it would mark the first foray outside the island nation by Castro, 77, since taking the reins of power from Fidel Castro in July 2006 when the elder leader underwent intestinal surgery. Raul Castro officially succeeded his ailing 82-year-old brother last February when Fidel announced ahead of an election that he was stepping down, after staying in power for nearly 50 years despite a US trade embargo in full force since 1962. Lula is friends with Fidel Castro and he had not ruled out a meeting with the Cuban leader before departing for Brasilia at 3:30pm local time (2030 GMT). The Brazilian president arrived in Cuba on Thursday and held talks with Raul Castro, to whom he "renewed the invitation" to visit Brazil and help with the first-ever integration and development summit for Latin America and the Caribbean on December 16 and 17 near Salvador de Bahia, according to an official statement. The text hailed the "positive developments in bilateral relations" in several fields as well as a sharing of mutual regional and multilateral interests. Economic and commercial ties between the two countries were given a boost with Lula's first visit this year to Cuba, in January, and when a senior official visited in May to firm up 10 business agreements. According to official Cuban figures, bilateral trade rose to 450 million dollars in 2007, making Brazil Cuba's second largest trading partner in South America after Venezuela.